In Goodbye, Vitamin, her outstanding debut novel, Rachel Khong provides a crisp and affecting look at how early-onset Alzheimer’s can reshuffle the members of a family. Thirty-year-old Ruth Young, who has just been dumped by her fiancé, moves back to Southern California to help her parents, who are knee-deep in their own hot mess. Ruth’s mother is scarily preoccupied with tending to a certain unspoken grief, while Howard, Ruth’s father, sinks into dementia. It becomes clear that Ruth is expected to act as Howard’s primary caregiver. Despite her sorrow and (frequently hilarious) neuroses, she assumes the role with tenderness and aplomb. All of Khong’s prose is like this: original and precise and empathetic, with the power to make the hair on my arms stand up. Alzheimer’s, it goes without saying, is no party. 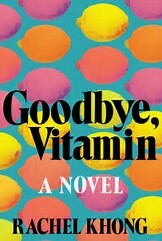 But Goodbye, Vitamin is unexpectedly humorous. Ruth is a vulnerable and creative heroine who tries to make the best of a bad situation, holding her family together and even concocting a plan so Howard—an acclaimed professor of (you guessed it) history—thinks he’s still teaching at the university. Ruth’s two best friends, Grooms and Bonnie, likewise bring a great deal of playfulness to the plotline. The nature of memory is certainly not a new theme in literature, but Khong puts a fresh spin on it in Goodbye, Vitamin. Ruth wonders, “I realized I could remember something and he could remember something different and if we built up a store of separate memories, how would that work, and would it be okay?” This is the essential question posed by the novel, and Ruth ultimately arrives at more than one answer. As Goodbye, Vitamin comes to a close, we know what awaits Howard as the plaques and tangles in his brain continue to prevent his nerve cells from transmitting normal messages: “The cells keep trying and trying and trying, but in the end they’re choked off. In the end, they die.” But Howard’s demise is his daughter’s awakening. She comes into her own with an unflinching new maturity. Funny enough, what I loved most about Khong’s book—Ruth’s delightful, choppy little musings and meditations—was also what left me wanting more. It was such a treat to climb inside her head for 194 short pages that I would’ve happily stayed there twice as long.